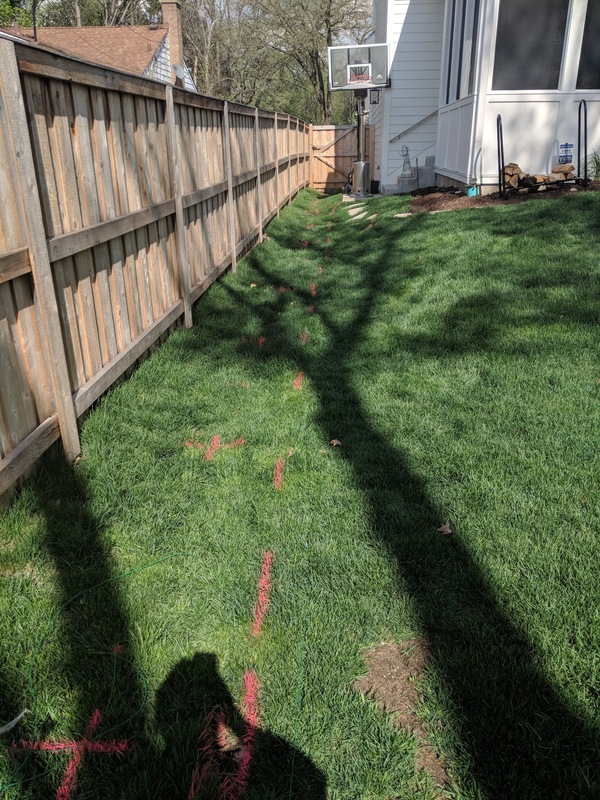 Back at the beginning of April, I posted a photo of the sideyard where we've been planning on putting up a privacy hedge/screen consisting of European Columnar Hornbeam trees. At the time, I called it a 'last look' at this area, but here we 50 days later and guess what? Still no trees. Still no privacy in the screened porch. But that pink paint you see above? That's a good sign! The trees are on their way. Working with Chris Paul of Green Grass Landscaping (did I mention that Chris was the Consul - aka President - of my Fraternity House in College!) just marked out the locations of each of the eight trees that are being installed. The photo above is the one looking east towards the front of our house. In the top right, you can see our screened porch. 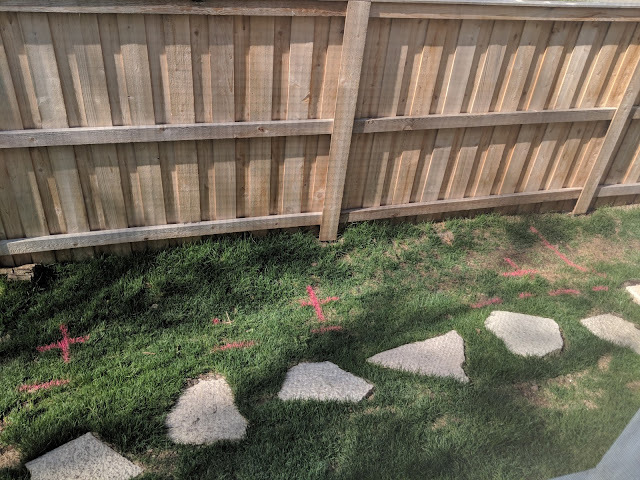 The pink x's painted on the grass are where the tree trunks are planned to go: 6 feet apart and 30 inches from the fence. That will allow them to spread a bit and - over time - become a hedge. Take a look at the photo in this original post that shows a mature set of Hornbeams and shows the plan details of this section. We're installing 3" caliper trees, so we won't have this look just yet, but given time, we hope we'll achieve much that same look. The most pressing need is right outside of our screened porch. On that side of the house, we're up on an incline with a pretty steep drop off near the fence. Check out the photo below: see the stairs? That shows you how far down the bottom of the fence is from the first floor. There's another stair that is 'hidden' behind the wall on the right, so that's six steps down. Making the top of the fence not much higher than the lowest part of the walls of the screened porch. Wouldn't be bad if we weren't staring right at our neighbor's backyard and stoop. Also, in the photo, you'll see the first three x's for tree locations. Across the screened porch, we're putting three trees. Also, the pink dashed line show the perimeter of the landscape bed. Instead of having grass in between each of the trees, we're just going to with a large, connected bed. 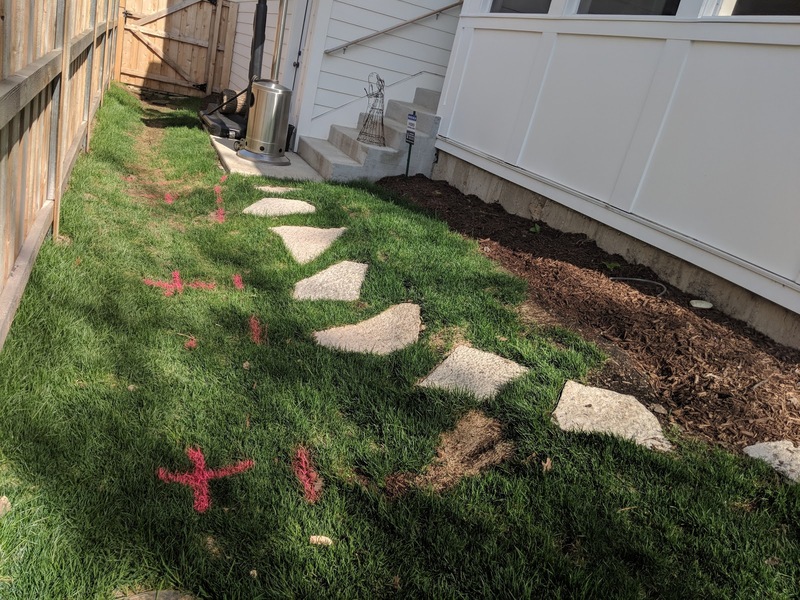 Where the flagstone steppers are currently, a walkway will go made of pavers - including a retaining wall and a raised bed against the screened porch. From the inside of the screened porch comes this view below: same three tree locations. 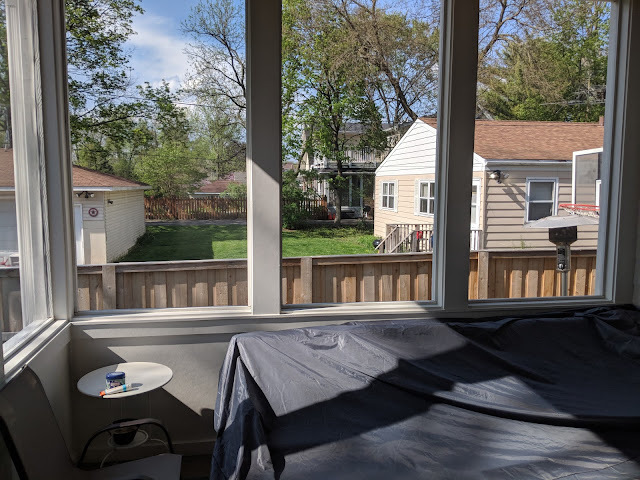 And, here's the 'before' view out of the screened porch. See what I was saying about looking right into our neighbor's backyard and back stoop/porch? Once the trees are installed, I'll take another photo from this same angle to show you the 'after'. 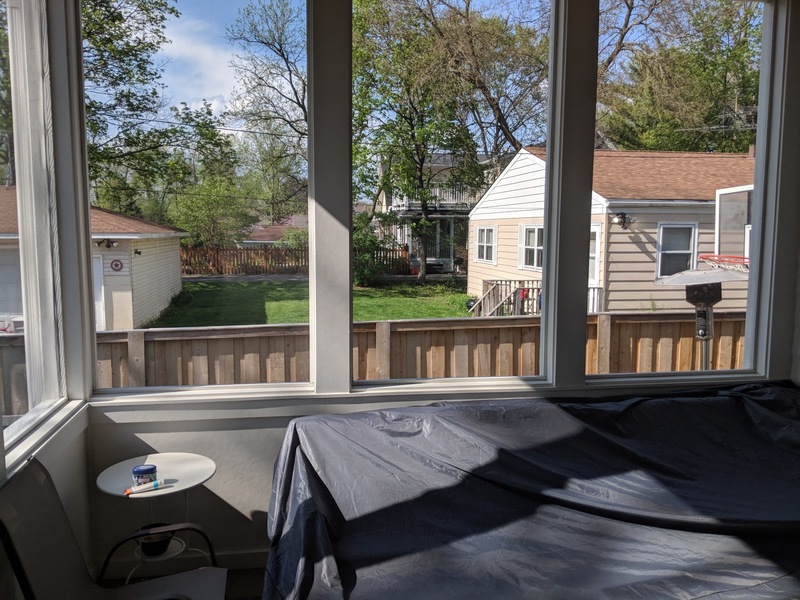 Sounds like the trees are just starting to leaf out, so they'll take some time to provide that genuine privacy hedge, but I'm hoping that this Summer, we'll see some greenery up three of four feet above the fence line - thus eliminating some of the view out (and their view in! ).